Who doesn’t love snacking on popcorn? 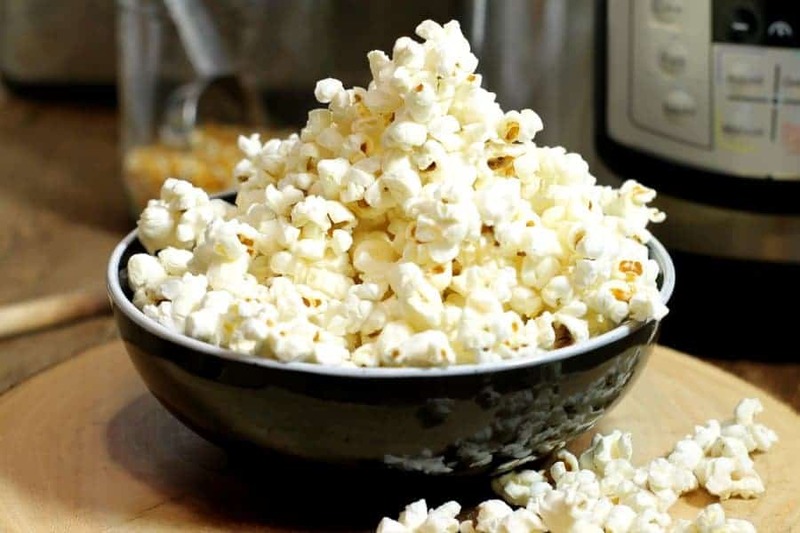 A surprisingly healthy and addicting snack, popcorn is much better for you then chips, doritos or any other kind of convenience snack available. The best part of all this? 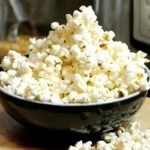 Making instant pot popcorn is probably the easiest ‘from scratch snack’ you’ll ever make at home, and you can make as much, (or as little) as you want. Most folks may not know it, but homemade popcorn is a surprisingly cheap snack to make. It’s even cheaper then buying those microwave popcorn bags, (which are horrible for your health by the way) and you can flavor the popcorn however you like! 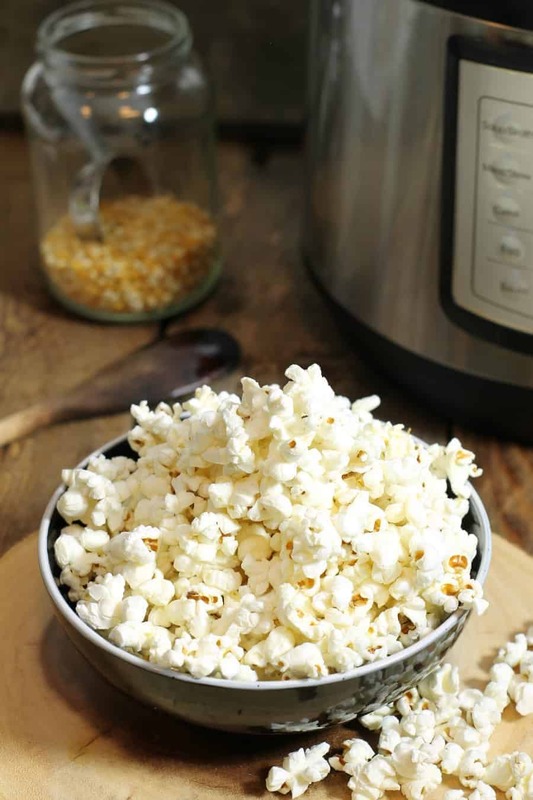 In the recipe below, I’ll walk you through making your own popcorn in an Instant Pot, and six popular seasonings to keep things interesting! If you don’t have an Instant Pot I’ll be including instructions for stove top popping in the recipe card at the bottom. What’s The Best Oil To Use When Making Popcorn At Home? Especially when made at home, popcorn can be a healthy snack for you, (or your kids)…..if you don’t slather it in butter of course. That being said you do need to use some type of oil or fat to ‘cook’ the popcorn kernels in. The oil ensures that the kernels are all heated evenly and start to pop at roughly the same time. Without some kind of oil, the corn kernels would burn before popping. While many people advocate for using olive oil because of its higher level of monounsaturated fat(the good fat), it unfortunately has a relatively low smoking point. This means it will burn much faster then other oils. Butter has an even lower smoking point and I do not recommend using it to pop popcorn.It’s better to drizzle melted butter over the popped corn as flavoring after the corn is cooked to prevent burnt tasting bits. Update: DO NOT USE VEGETABLE OIL SUCH AS CORN OR OLIVE OIL AS THEY HAVE LOW SMOKE POINTS AND WILL BURN EASIER. So Which Oil Is Best For Making Instant Pot popcorn? I personally prefer and reccomend using extra virgin coconut oil. While it does have more saturated fats per gram then other oils, it is still a healthier option then corn or peanut oil which are highly processed. Extra virgin coconut oil also has a very high smoke point ensuring that it wont burn, and as a bonus all the kernels will pop much more evenly! Melissa and Danielle did extensive testing to find out which oil produces the best results, and Extra Virgin Coconut Oil took first place! If you have a hard time finding coconut oil locally, I have found Amazon to be a reliable and cheap place to order it! To follow these instructions you will obviously need an Instant Pot. If you don’t already have one, I suggest you get on the band wagon! The Instant Pot is great for making recipes which would normally take over an hour to cook. Things like Instant Pot Onion Soup, or Chicken Stock are just a few of the things you can make in it! You can purchase an official Instant Pot Glass Lid (Affiliate Link) to make this recipe, but is not really necessary. The official lid is tempered, dishwasher and oven safe, and is available in various sizes to fit different Instant Pot models. That said, I don’t have one, and used a run of the mill glass lid I already had in the cupboard. Start by plugging in the Instant Pot and pressing ‘saute’. Turn up the temperature by pressing ‘adjust’ until the red light moves to the ‘more’ sign. Press ‘saute’ again to start the program. The display should now read ‘ON’ and the Instant Pot will start heating up. Once it is ready to go, the display will say ‘HOT’. This can take between two and four minutes depending on the size of your Instant Pot. Once it is pre-heated, add the extra virgin coconut oil to the pot and let it melt completely. Add the 1/2 cup of popcorn kernels to the Instant Pot and using a wooden spoon stir the kernels around to evenly coat them in the oil. The popcorn won’t start popping right away, and you have about two minutes before anything will start to happen. In this time, give the kernels a few more stirs, (you will hear them sizzling) and make sure they are evenly spread out over the bottom of the pot. Cover the Instant Pot with a large tight fitting lid, (glass is ideal so you can see when the popcorn stops popping). It can be any large lid you have, as long as it covers the Instant Pot completly. Now for the fun part! You’ll see the popcorn start popping! At first it will start fairly slowly, but the speed at which the kernels pop will pick up until most of the kernels have been cooked. When the popping starts to slow down and you can count 15 seconds in between pops, pick up the pot by the handles and give it a little shake. This will let any un-popped kernels drop to the bottom and increase the chance of not having any uncooked kernels in the pot. Remove the lid, and using an oven mit or dry towel, remove the Instant Pot insert and pour the freshly popped popcorn into the mixing bowl. Be careful doing this, the steel insert is hot( though the lid will not be), and you may burn yourself if you’re not careful. Having problems with burnt kernels? Let’s figure it out together! Leave a comment below with what went wrong and I’ll leave some tips for you! In the mean time here are some reasons your popcorn may not be popping. Oils such as canola, peanut, corn, or olive oil may all be used but they have varying smoke points and may heat differently. This results in less evenly popped corn, or burnt kernels. If you find the kernels to burn without popping, try the recipe on a lower heat setting. Another reason the kernels may not be popping could be that the popcorn kernels are dried out and old. Popcorn pops because the moisture trapped inside heats up creating pressure. When the pressure becomes to much for the hard skin….POP….the kernels pop. Old kernels or ones which have been stored to long and have dried out will not pop. Avoid buying kernels in bulk as they may not have been stored in airtight conditions resulting in moisture loss. Also check the expiry date, and choose the ‘freshest’ kernels at the store. Once the popcorn is finished popping, you can season your homemade Instant Pot popcorn. Don’t be afraid to get creative and try new spice mixes! You can even make brown butter popcorn by letting the butter brown in a pot on the stove and then tossing it with freshly popped corn! Keyword can you cook popcorn in a pressure cooker?, how do you cook popcorn in the instant pot? Add 2 tbsp of extra virgin coconut oil to the pot and let it melt. Add half a cup of popcorn kernels and stir them around with a wooden spoon. Stir and evenly spread the kernels over the bottom of the Instant pot for about a minute. You will hear them start to sizzle. Place a glass lid over the Instant Pot. An official Instant Pot Lid is available though not required. Any Large lid will do. It can take around two minutes for the corn to start popping as it heats. Larger Instant pots may heat faster then smaller models. Let the popcorn pop for about 5 minutes. When the popping slows to one pop every 15 seconds, shake the pot and let any uncooked kernels pop. Remove the lid and using an oven mit or dry towel, pour the freshly popped popcorn into a serving bowl. Place a thick bottomed pot on the stove and melt the coconut oil on high heat. Add 2 or 3 individual kernels of corn in the pot and cover them with a lid. Once they are popped you know the oil is hot and ready to go. Add the rest of the popcorn kernels and recover the pot. Cook for 3 to 4 minutes or until the popping slows down. Remove the pot from the heat and shake occasionally until popping has stopped. Remove the popcorn from the pot and season then serve in a bowl! Oils such as canola, peanut, corn, or olive oil may all be used as well, but they have varying smoke points and may heat differently, resulting in less evenly popped corn, or burnt kernels. you have old popcorn kernels. Popcorn pops because the moisture trapped inside heats, and when the pressure becomes to much, POP, the kernel pops. Old kernels or ones which have been stored to long and have dried out will not pop. I have the same complaint a few other reviewers made, in that following the instructions exactly, only a few kernels pop. I have tried several times without success. The same popcorn pops fine in the microwave. I live at an altitude of almost 3,000 feet. I was wondering if maybe altitude would be a factor in the corn not popping properly in the IP. I have the 8-qt IP. As yet, I have not tried soaking the popcorn in water for 10 minutes. I will give that a try. That’s interesting Bob, at a higher altitude the cook time would technically increase as the boiling point of water is higher. If you are having kernels burn before they pop though, I am not sure what the cause for that would be. If a corn kernel does not pop at a certain temperature and burns instead, it is dried out and the lack of internal moisture is the reason for it not popping. Are you able to pop popcorn on the stove in a pot with oil? The instant pot method is virtually the exact same except its not a pot on the drive but an appliance doing the same thing. Let me know if anything changes for you! You use refined or unrefined? I only buy the unrefined virgin coconut oil but I thought the smoking point was around 350. I use it more then other oils to cook with, but I am careful not to overheat it. I usually make popcorn on the stove but just got the Instant Pot and will definitely try this! I usually use expeller pressed sunflower oil when I make it on the stove due to fear of the coconut oil hitting it’s smoking point too soon. Now I know too that I can use coconut oil in the Instant Pot 🙂 A lot of recipes call for olive oil and I was hoping it was safe to use coconut oil instead! I do only ever buy unrefined coconut oil as well. Making the popcorn in the IP should work problem free using unrefined coconut oil. I have a 3-quart Duo Mini Instant Pot. Is it too small for making popcorn or how should I adjust your recipes for it, please? Hi Brenda, I would suggest doing a half batch of this recipe since the 3 quart isn’t very large. I’m honestly not that filler with the model, but as long as you have a saute function the instructions should stay the same. Instant Pot support has indicated to me that all models heat the same +/- 5 degrees. Great idea to make popcorn in the Instant Pot. Looking forward to giving this a try. Cheers. Hi! Have you ever done Kettle Corn? Any suggestions? Thank you! I Michele, by Kettle Corn, do you simply mean cooking it in a pot on the stove? 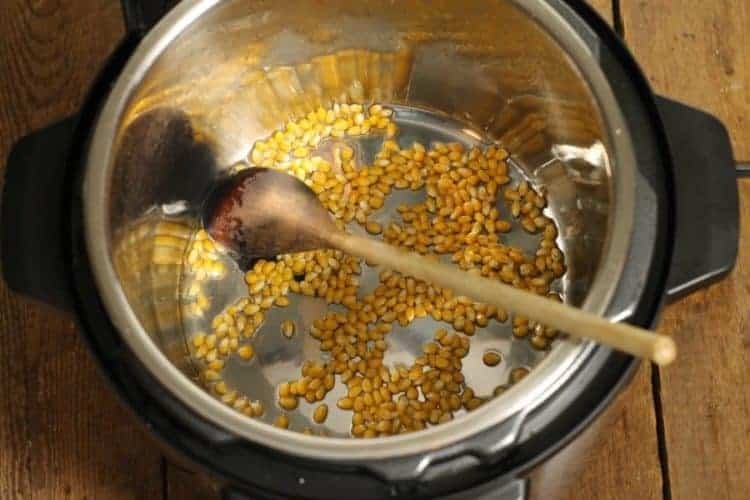 I have yes, the method is very similar to the Instant Pot Popcorn method described above, you would simply keep the heat on a medium setting on the stove and add the corn kernels once the oil is hot. 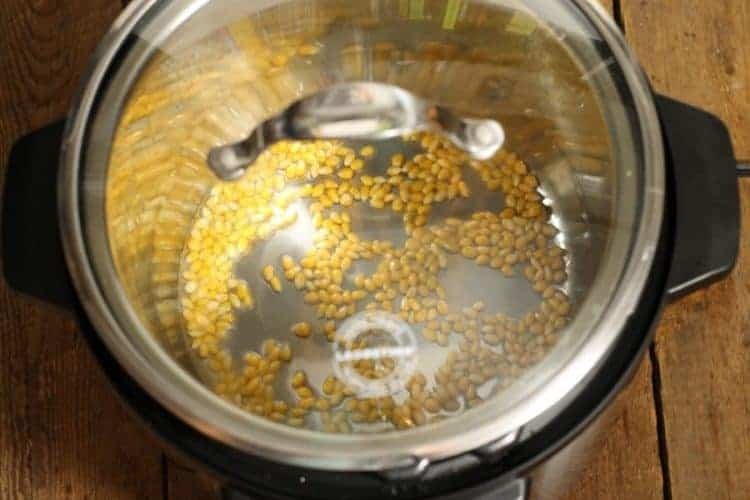 You would cover the pot with a lid just as you do in the Instant pot, and once the popcorn is done popping you would remove the pot from the stovetop. Hope this helps! Kettle corn has sugar on it…melted in the oil I believe…then the popcorn is added..it has to be stirred while popping…in a big kettle. I See! thanks for clarifying! I followed instructions including soaking the kernels. Only a portion popped and had to finish on stove. Seemed like the IP (I have an 8 qt) got to the “Hot” setting and quit working (thought it was too hot and shut off heat and thus the kernels ceased popping). Hi Jim, It sounds like your Instant Pot malfunctioned. If the pot is overheating in under 10 minutes there is most likely something wrong with it. I have had mine on saute (more setting) for over half an hour before without it over heating (I was boiling down a chicken broth to concentrate it’s flavor). Additionally, if you followed the recipe correctly, once the Instant Pot has heated up, and you add the oil, popcorn kernels, and finally the clear glass lid, the steam produced from the popping corn would naturally condensate and drip back down, cooling the cooking surface enough to prevent it from over heating. I would suggest trying the recipe on the ‘normal heat setting otherwise. Good luck I hope you get it figured out! I like chipotle seasoning with white cheddar cheese. That sounds delicious! I also love adding chipotle or other spices to my popcorn! I’m having a hard time with the popcorn kernels not popping. We bought new popcorn. I don’t know how fresh it is. Do you have a certain brand that you like? Hi Judy, I don’t have experience with other brand models unfortunately. Theoretically as long as you have a ‘heat’ or ‘saute’ function that lets you use the pot as a frying pan will let you make popcorn in it. The brand of popcorn you use is important, so don’t cheap out, because it may burn otherwise. What model do you have? I can do some research for you if you like. I tried making this last night two different times and same results both times. Only some kernels popped, the rest just burned. Followed the directions exactly. My kernels were brand new from the store. I love my Insant Pot but I think I’m going to have to buy another air popper to make popcorn. Hi Jenna, I’m sorry to hear that. What model Instant Pot do you have? I have found that some tend to heat to high to fast, causing burn issues. Can I ask you to try it one more time but on a low saute heat setting? About 20 popped and the rest burned. We just made it in the stove with this container so I’m sure the kernels are not old. Are you letting the Instant Pot heat up properly before adding the oil and the kernels? The only reason popcorn doesn’t pop is that it is old and doesn’t contain any more moisture in it. I would suggest purchasing some new popcorn kernels and giving it another shot! I just made a batch myself! Have you tested this recipe with grape seed oil? Hi Carol, I have not personally tried making Instant Pot popcorn with grapeseed oil. The main reason, it’s expensive and I find better suited to use as a salad oil. When cooked it can take on a quite bitter taste that may no be palatable. From a cooking point of view, it has nearly the same smoke point as coconut oil or canola oil, and as such should work much the same way. Super easy! Came out perfect the first time. Thank you! Awesome! Glad to hear you liked it! What did you season the popcorn with? If at all? can the recipe be doubled and still work? Hi Kristen, In theory yes it can be doubled. The problem is the Instant Pot is only so big, and especially if you have a smaller sized unit, it may not end up heating all the kernels properly once they start popping. There is a higher chance of burning the popcorn before all kernels have popped. I am starting to wonder if there’s anything that cannot be made in the instant pot! This popcorn looks amazing – I need an IP pronto! My husband just got me an IP, and popcorn is my favourite snack ever. I can’t wait to try this! Wow – so many things you can make in the Instant Pot. I definitely need to get one now! I NEED to drop what I am doing and go get me some garlic herb popcorn!! So serious!! That’s genius!! I need it! That is so neat how you can make popcorn in the instant pot! All your seasonings sound great too. Can you do it without oil? Coconut oil is so high in saturated fat, I’d be scared to use it. I like my arteries clear. LOL. Oils in general are so bad for you, I’d like to do it without oil. Unfortunately no you will need to use some kind of fat to cook the popcorn in otherwise the kernels will just burn. While coconut oil is a saturated fat, it’s high smoke point makes it ideal for this application. Since your probably not eating a whole bowl of popcorn by yourself, you wouldn’t even be consuming the whole 2 tbsp of oil this recipe calls for. Everything in moderation is the key! “…It’s better to melt the butter desperately and drizzle it over the popcorn once its popped.” Given the high price of butter, I suppose I must be desperate to use it. ???? My husband loves popcorn nachos, melted butter, shredded cheddar cheese, and sliced jalapenos! I have never had popcorn nachos! But spicy popcorn! I can totally see this being good. Crunchy, delicious snack food!! What oil can be used other than coconut? I do not like the flavor and my daughter has a nut allergy. Hi Kristi, Any oil can be used. As I mention in the post canola, corn, or peanut oil are all perfectly suitable as is olive oil.